Libya was an Italian colony from 1911 until after WWII. In 1952 they got their independence and a king from neighboring Algeria. In 1959, when Americans from Texas discovered oil, Libya was one of the poorest countries in the world with an annual income of just $25 per person. In 1969, Colonel Gaddafi staged a coup becoming the first Libyan to rule since the Roman Emperor Septimius Severus in 211 AD. He remains in power and is generally referred to as The Leader. In 2003 five days after Saddam Hussein was captured, Gaddafi decided to end his long isolation. He gave up his nuclear weapons program and turned over the material to the US Government, who he had been in negotiations with since the beginning of the Iraq War in 2003. 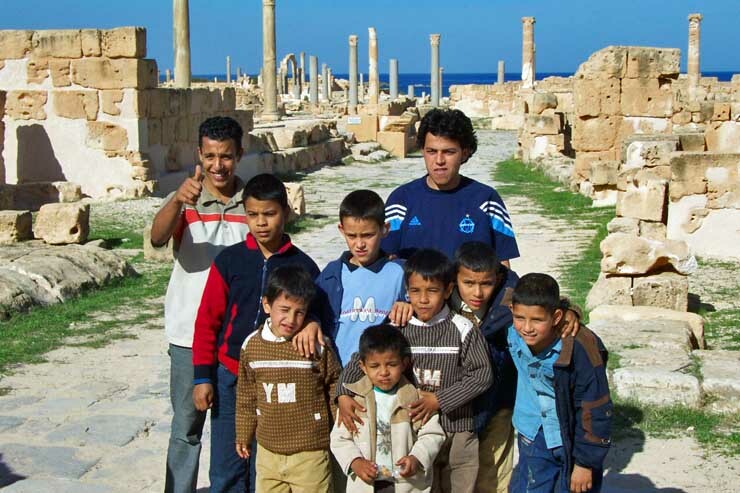 In 2004, for the first time in 28 years, American tourists are able to visit Libya. Libyans are very happy to see us because we are harbingers of better times. 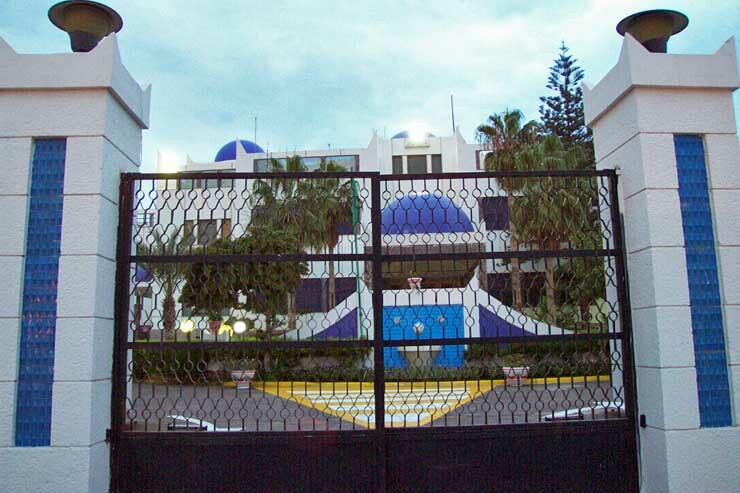 They told us the rumor about the the US Embassy location. Clicking on the Lonely Plant map accesses their site. 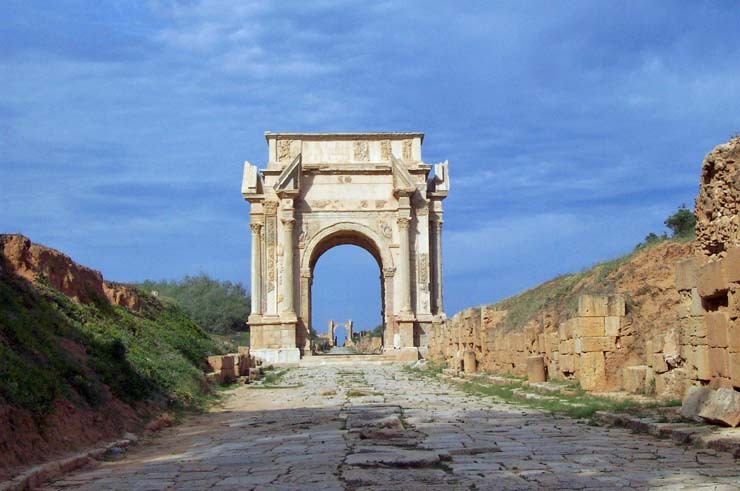 The photo shows the UTS group of 5 highly traveled tourists in Tripoli in front of Hadrian's Arch. 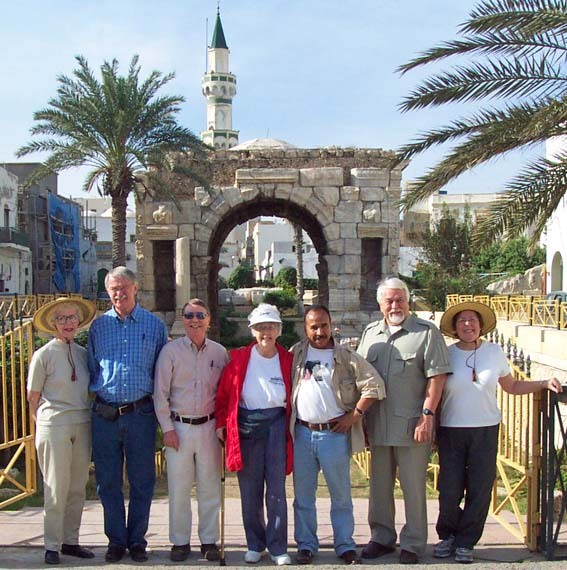 Herbert Goebels, the UTS tour director, and our local Libyan guide are right of center. I was with this group in Tunisia and Algeria. As standard operating procedure, we were also accompanied by a security man while in Libya. Libya has 5 million people and half of them live in Tripoli, which is very clean; but the rest of the country has a lot of trash. There are a million guest workers from Egypt and another half a million from other African countries. The oil wealth makes it possible for Libya to import workers to do jobs that Libyans don't want to do. 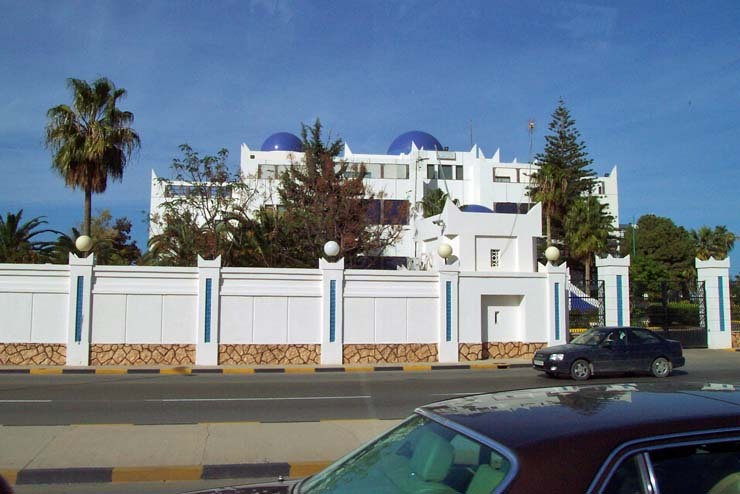 I learned that Arabs in other north African countries viewed the Libyans as lazy. Like Saudi Arabia, Libya enforces the Muslim prohibition against alcohol. No wine with your dinner in Libya. 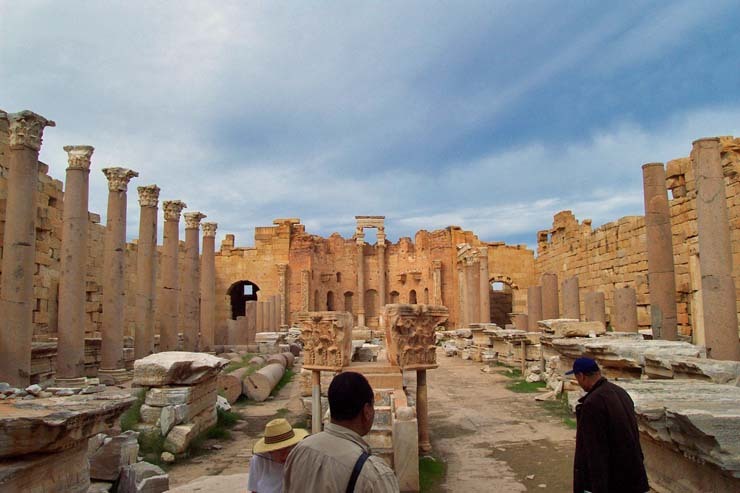 Libya was a chance for me to relearn the Arabic alphabet and to learn more about Islam. Islam means submission to the will of God. For example, Muslim men are not allowed to stand while urinating. Since God gave his laws in Arabic, all prayer must be in Classical Arabic regardless of your native language. Prayer is five times per day and the times are set. 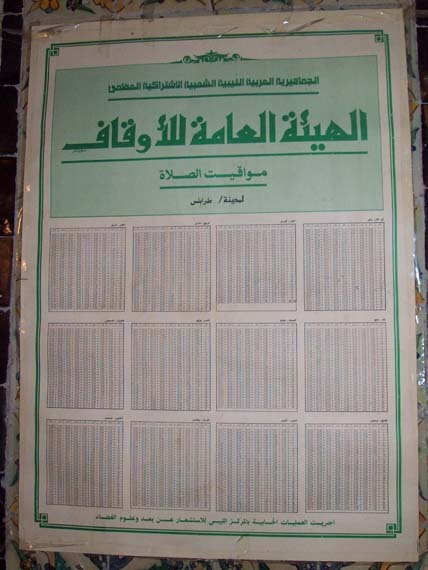 The photo shows the times posted on the wall of a mosque. If you are without a watch, you can determine prayer time according to the definition in the table. You must face Mecca while you pray. Some prayers are said out loud and others silently. Prayers have a fixed beginning and the variable part is the repeating of a set number of suras (chapters) of the Koran. If you don't have a sura memorized, you can follow the leader in the Mosque. I did not yet learn the bowing rules during prayer. 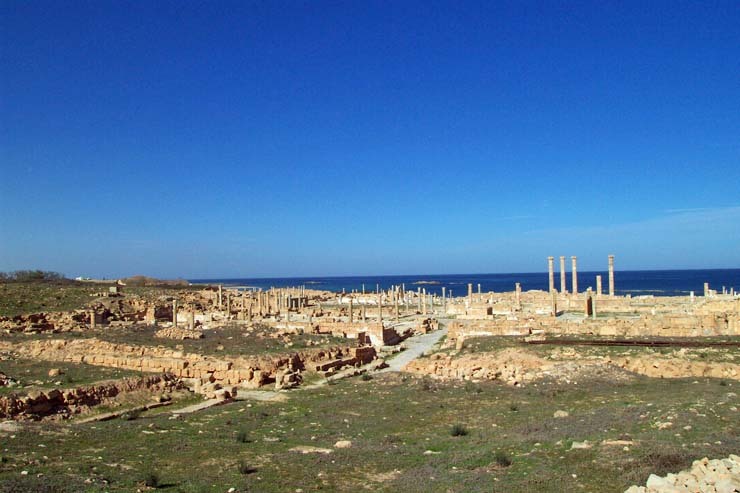 Libya has wonderful Roman ruins in Sabratha and some of the best Roman ruins anywhere in Leptis Magna, a city that rivaled Rome in beauty. 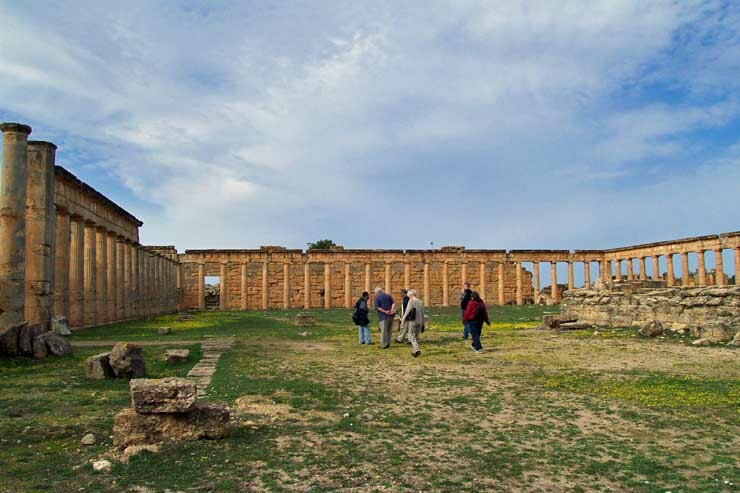 The Greek (and Roman) ruins in Cyrene are also not to be missed. We flew to Benghazi, the second city of Libya, and then spent several hours on a bus to see them. 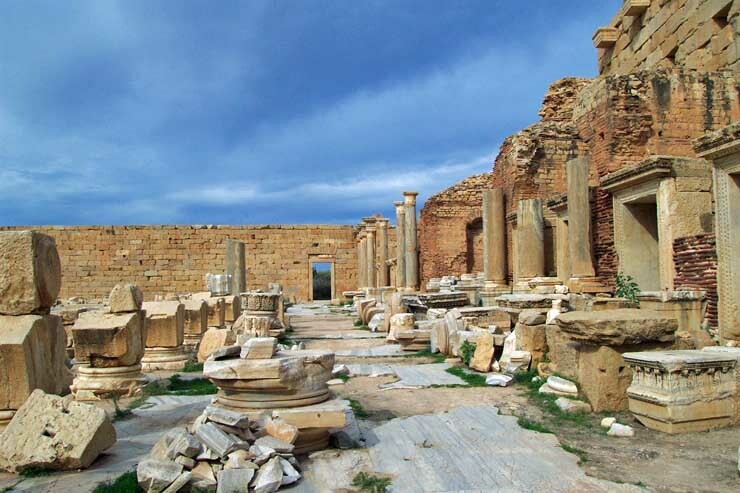 Most of the ruins were caused by the great earthquake of 365 AD. I don't know the facts, but I would guess that the 30 seconds of the quake destroyed over a 100 years worth of construction. Then there was the tsunami that followed which killed thousands in Alexandria, Egypt alone. 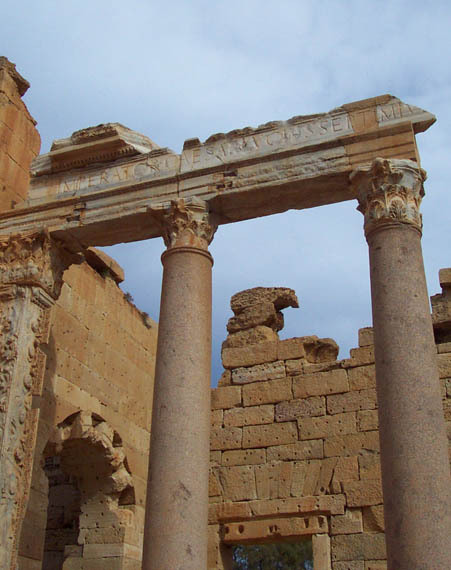 The quake of 365 AD was a factor in the decline of the Roman Empire. 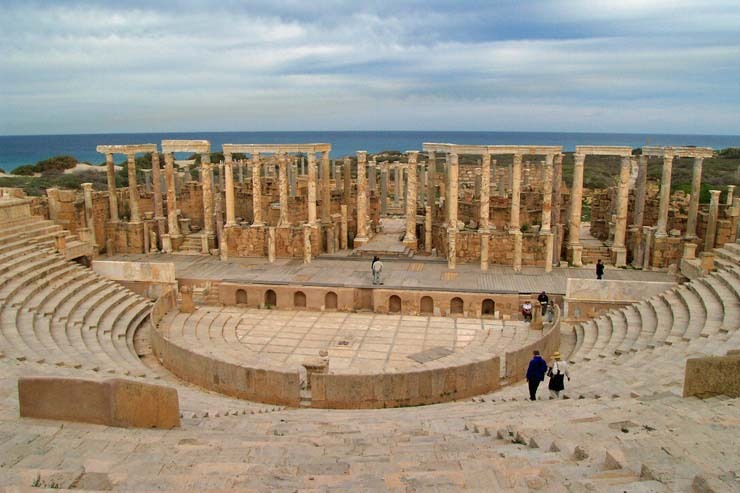 Since I took a lot of video, I don't have photos of the famous baths of Leptis Magna nor a photo of the amphitheater that held 16,000 people. When I arrived at the airport in Tripoli, the first photo I took was one of the leader of the country, Colonel Gaddafi. He also views himself as a leader of Africa. 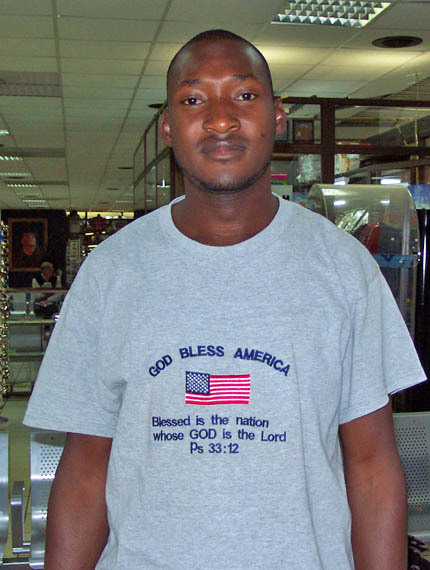 A week later I was in the airport and the last photo I took in Libya was of a man from Burkina Faso and his t-shirt. 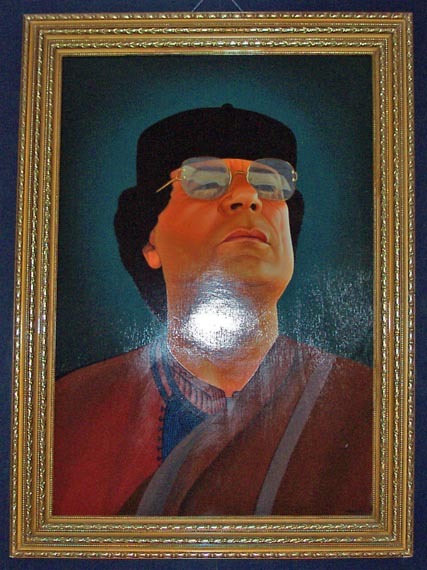 Gaddafi's portrait is visible in upper left. The former palace of the king is rumored to be the site for the US Embassy Here is a close up of the front gates. The Embassy has a great view of the sea. 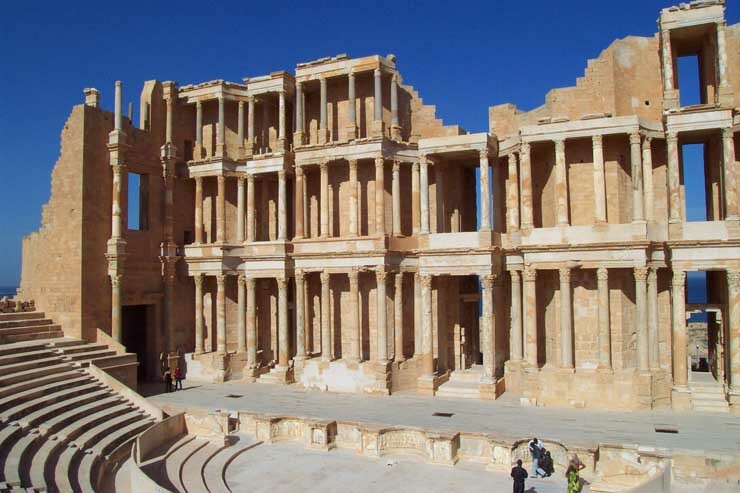 Sabratha was Romanized and rebuilt in the 2nd and 3rd centuries AD. The town had about 35,000 people and a choice sea-side location. 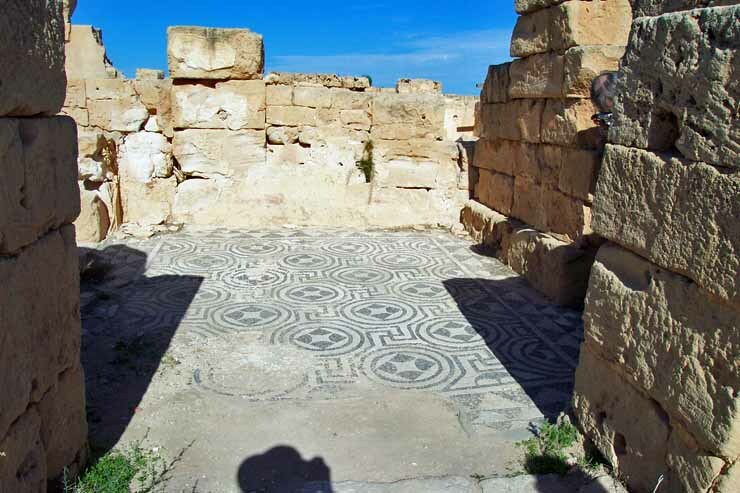 It's amazing to see mosaics withstand time and tourists. A nice group of boys was visiting. I wonder why their sisters were left home? Note marble toilets design which can be used both standing and sitting. 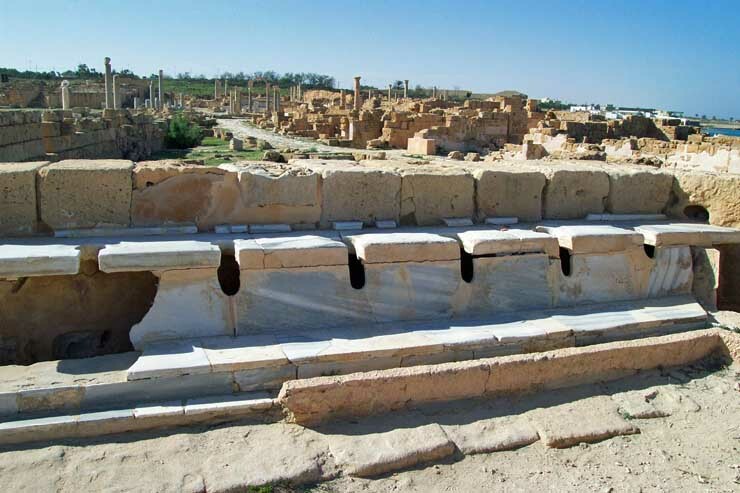 Another standard feature of a Roman town was the theater. 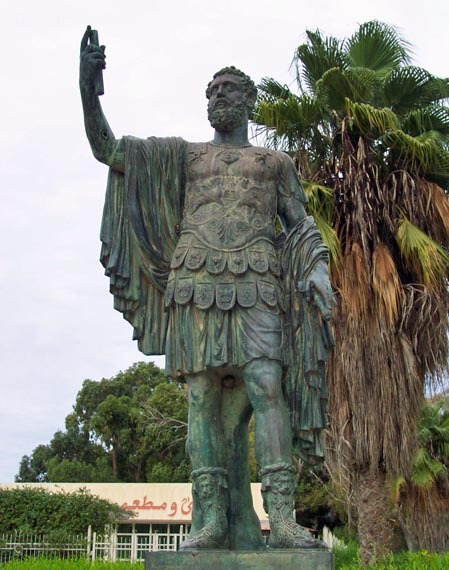 Septimius Severus, born in Leptis Magna, was the only Libyan to become a Roman Emperor (193-211 AD). 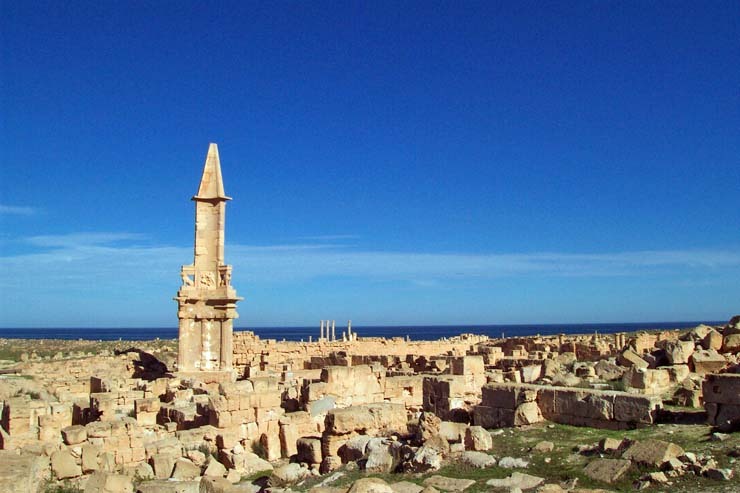 Leptis Magna was one of the most beautiful cities of the empire. His name is visible on the upper right of the photo. The inscription reads "Imperator Caesar...Septimus". Note how modern the font is. The Severus Arch stood at a crossroads. This is the direction to the sea. 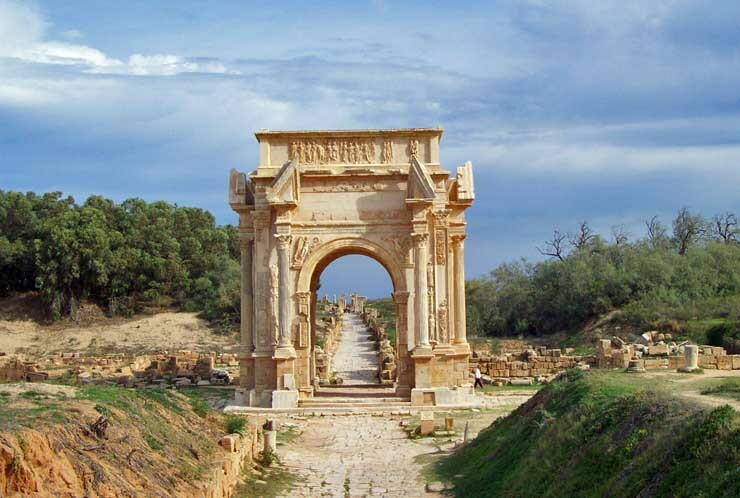 The Roman road ran across Africa thru the Severus Arch in the direction of Tripoli. All of the columns are made of granite from Egypt and marble from Italy. The oval sports area was surrounded by a columned area and roofed. The sheer size of the forum has to be seen to be appreciated. 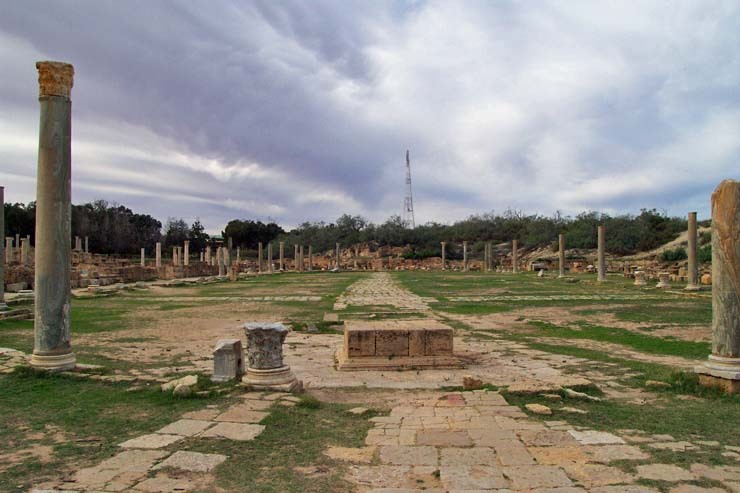 Here is another view of the forum in which the marble floor is visible. 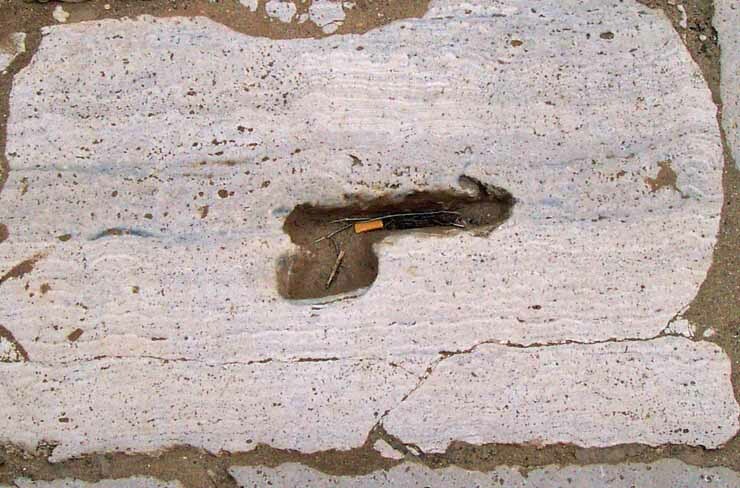 The walls of the basilica were originally covered in marble. A view of the basilica from the opposite end. 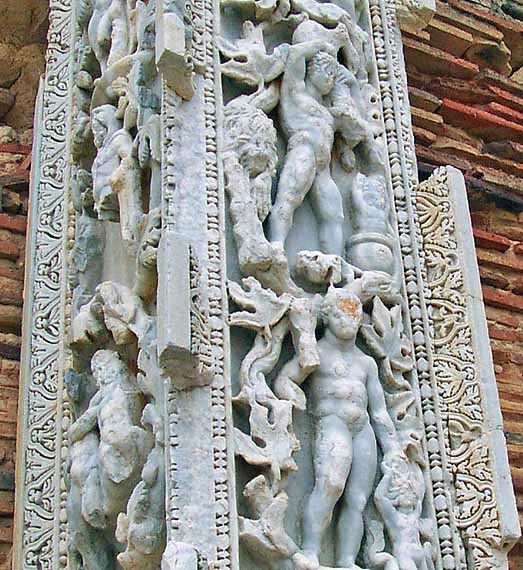 A detail from one of the massive marble carvings that adorned the basilica. The Romans combined scale and quality. 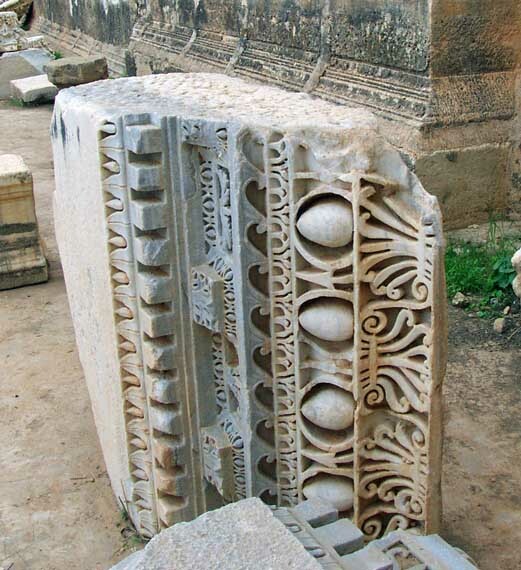 Note the sophistication of design and exquisite execution of this massive piece of marble. Doesn't this piece look modern? The Romans were practical. Here is a pointer to a house of pleasure in the pavement. 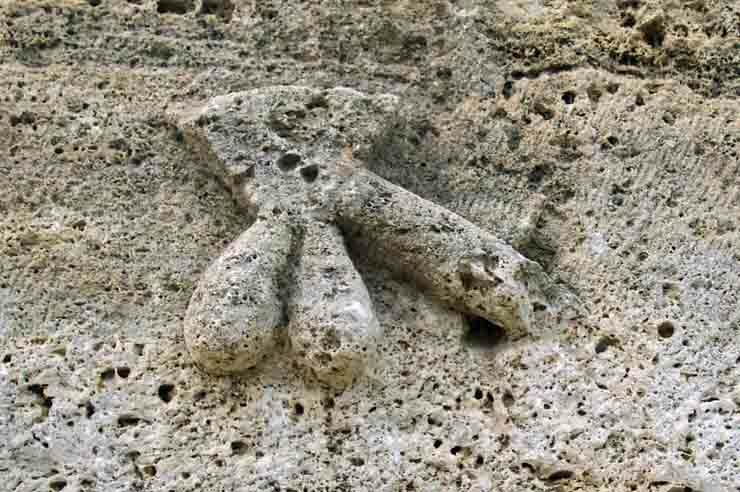 Since not everyone could read, here is a wall symbol to point to earthly delights. 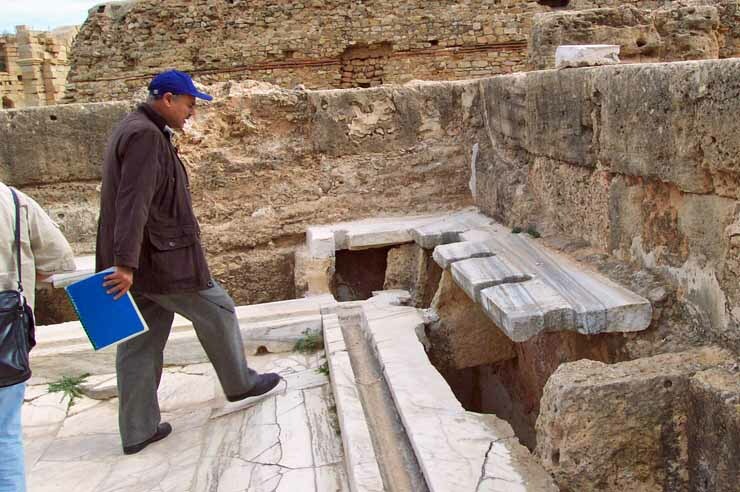 Toilets are marble, but the design allows no privacy. This magnificent theater holds 4,000 people. Acoustics are very good. 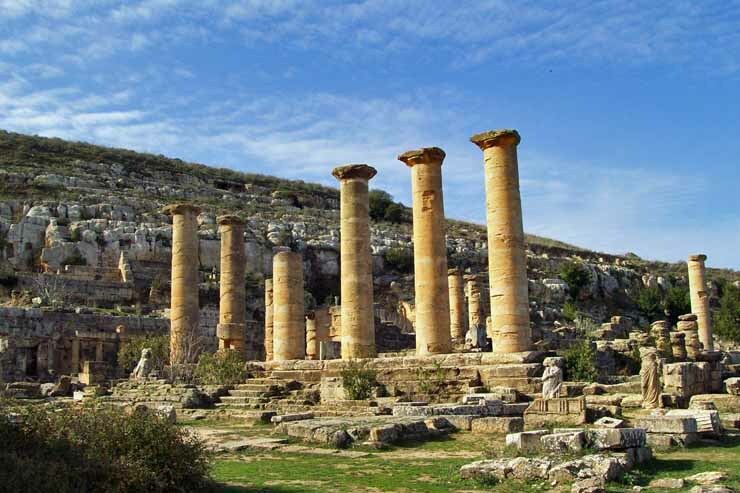 Cyrene is a Greek city from 600 BC. 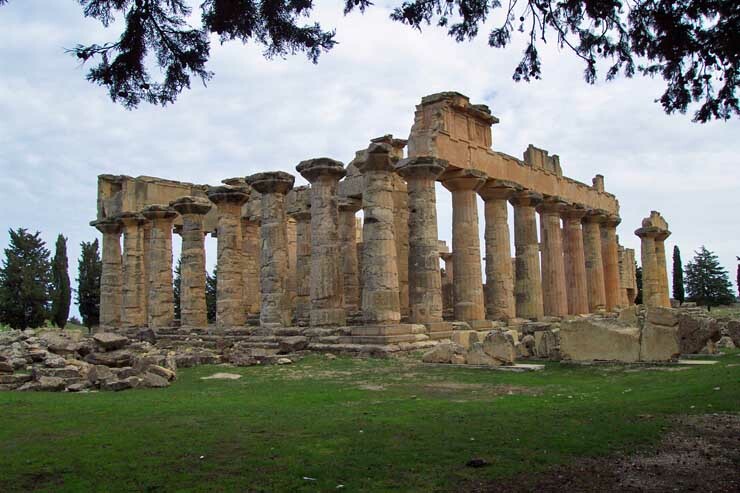 This is the Greek Temple in Lower Cyrene. 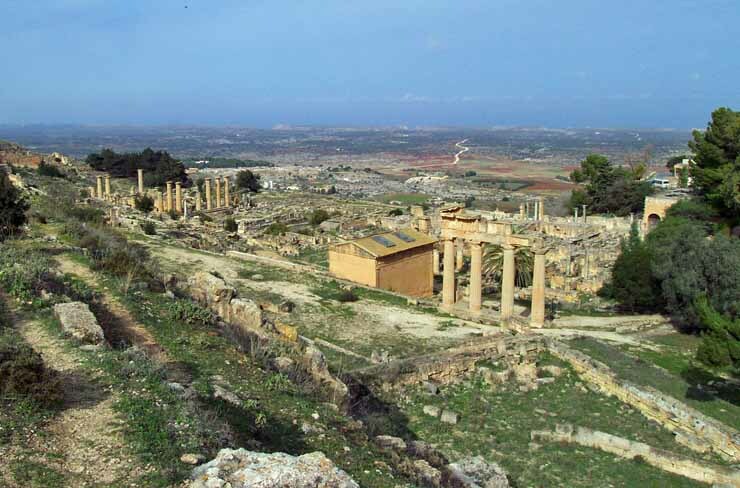 Greek and Roman ruins are on the hill of Lower Cyrene. The sea is in the distance. 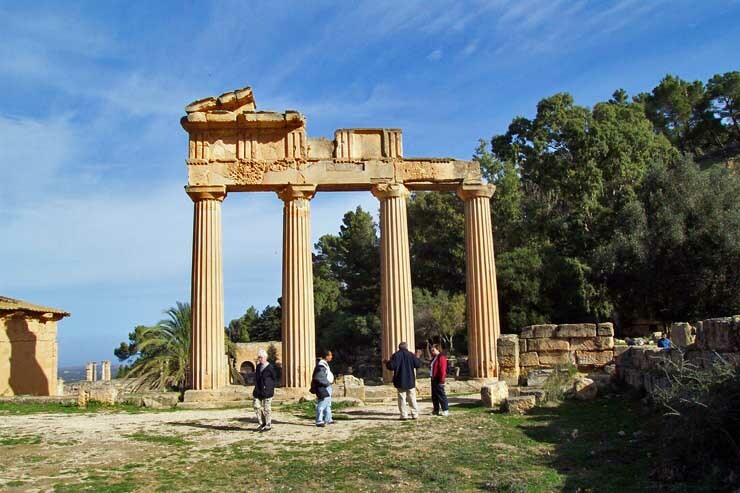 Cyrene has a wonderful location. 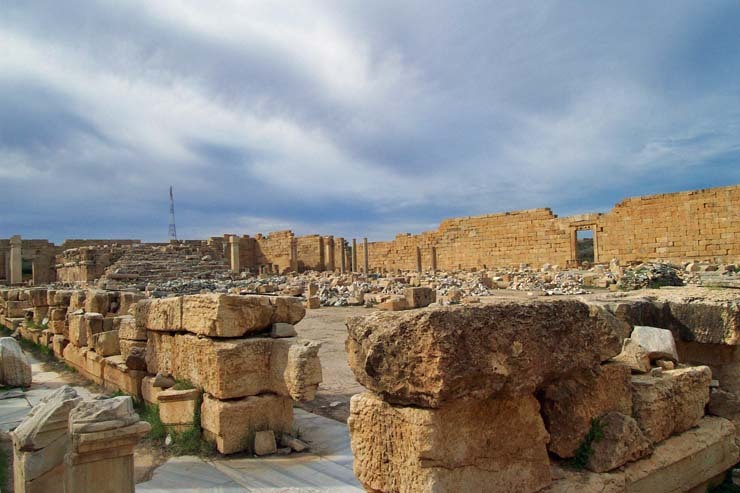 Roman ruins dominate the Greek ones. 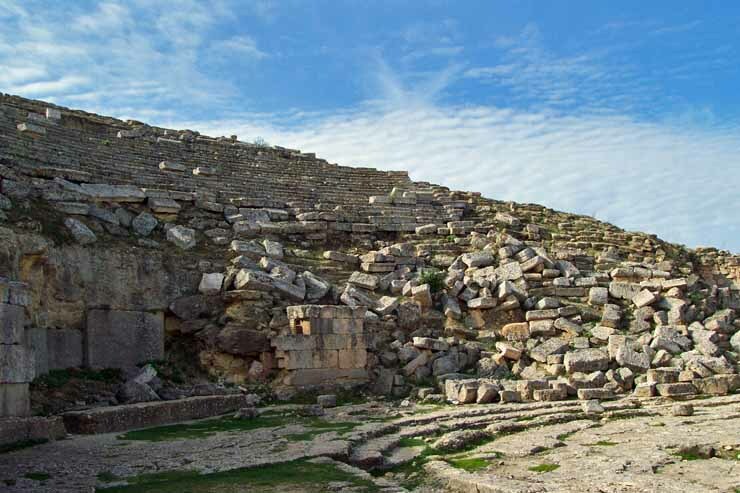 This theater was damaged in the great earth quake of 365 AD. 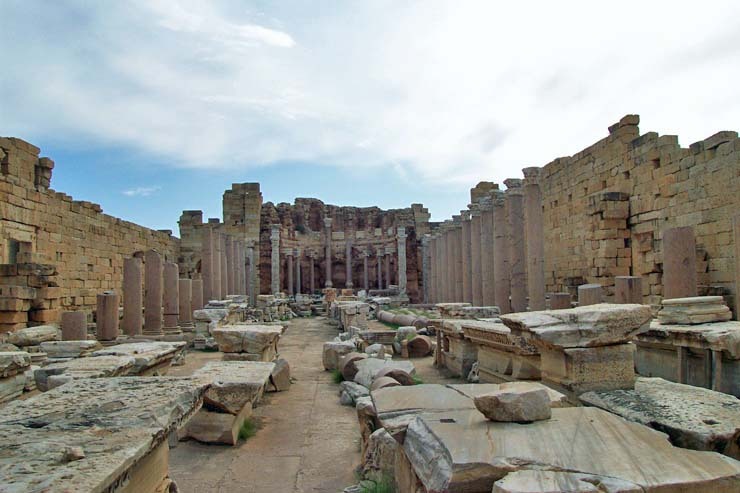 The Temple of Zeus is similar to the Parthenon in Athens, but the columns are larger. The inside of the temple had some cow droppings. 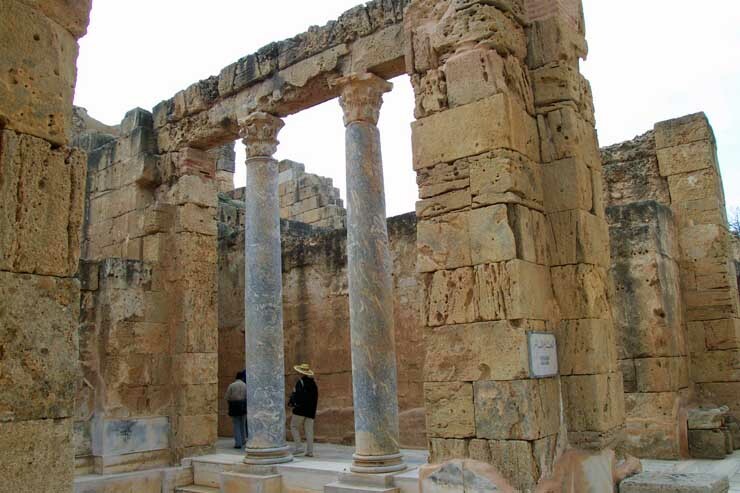 Cyrene remains a rural area. The scale of the Roman forum is amazing and hard to capture on film. 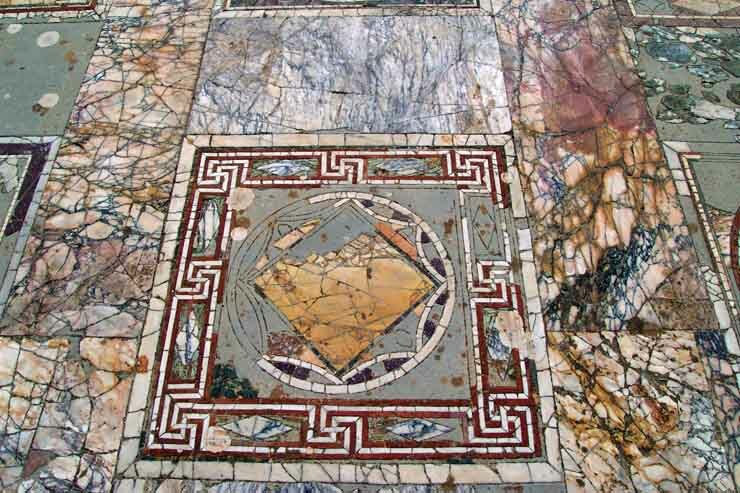 The quality of the materials, design and execution are seen in this Roman marble floor.